Chromecast Audio digital output to old Denon receiver - streaming DTS surround audio. There you go... A DTS stream of "Hotel California" (I think this was originally off my DVD-A copy of the album) streamed off the Chromecast Audio from the Plex server running on my Windows Server 2012 R2 machine in the basement. Controlled using the Plex app on my Galaxy Note 5 phone. Sounds great with no evidence of error (if there were, it would be obviously audible in the DTS stream). Alright, with that out of the way, let's just measure the Chromecast Audio's digital output connected to my TEAC UD-501 DAC and make sure the digital output results in the same analogue quality off the DAC as expected. 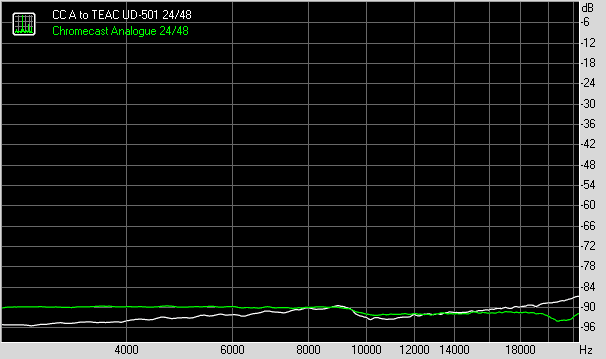 Frequency Response - as you can see the two TEAC UD-501 graphs are a perfect overlay. 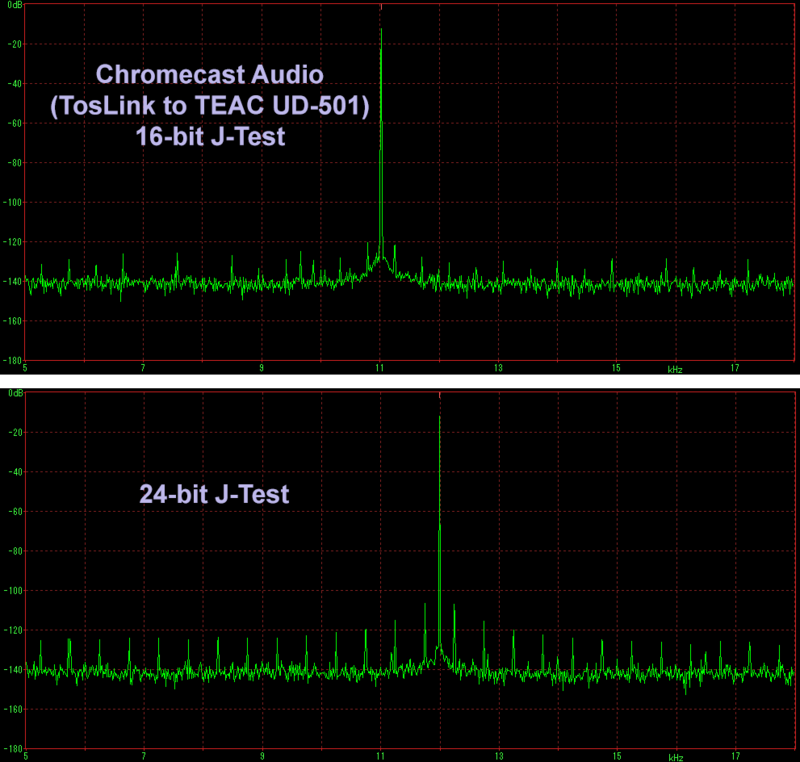 The Chromecast TosLink to TEAC UD-501 results in a dynamic range of >18.5-bits versus the Chromecast's analogue output of 17.5-bits demonstrated last week. Finally, let's look at 24/96 - the highest resolution the Chromecast Audio is capable of at this time. I did these measurements in my sound room where the recently built HTPC was connected by USB and through the computer's TosLink to the TEAC DAC. As expected, essentially no difference in measured DAC output whether using TosLink or USB interface, and whether it was with the HTPC or Chromecast. 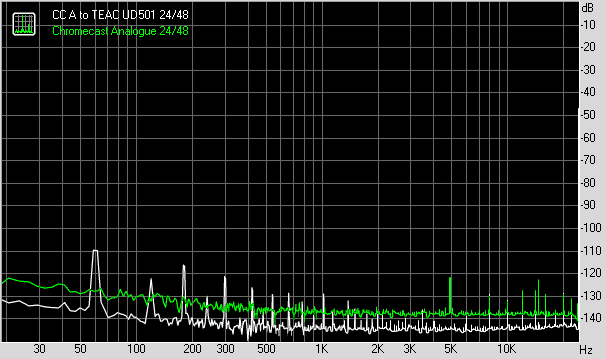 Basically, the "sound" was that of the TEAC UD-501 DAC as measured with typical test tones using RightMark. 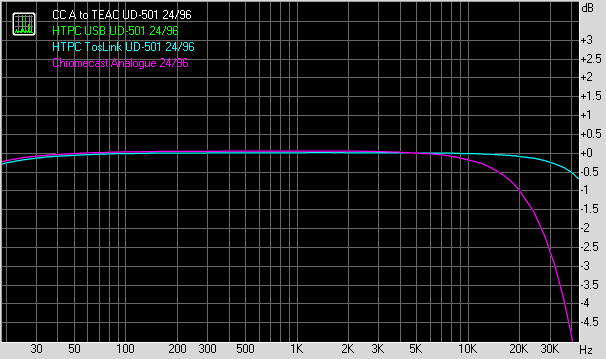 Frequency Response - notice all the TEAC UD-501 DAC outputs overlap exactly. 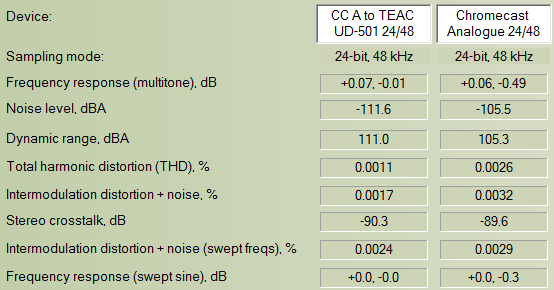 Noise Floor - TEAC UD-501 has 60Hz hum and harmonics. Though not shown, I tested 24/88 and am able to confirm no issues with the 88kHz samplerate using the Chromecast Audio TosLink output. So far, there are no surprises. Digital bits faithfully transmitted down a cable results in the same analogue output, measured using typical test tones for frequency response, dynamic range, and distortion amounts. Furthermore, I trust nobody would be surprised then if I say it would be in the jitter domain where I expect to see some differences. 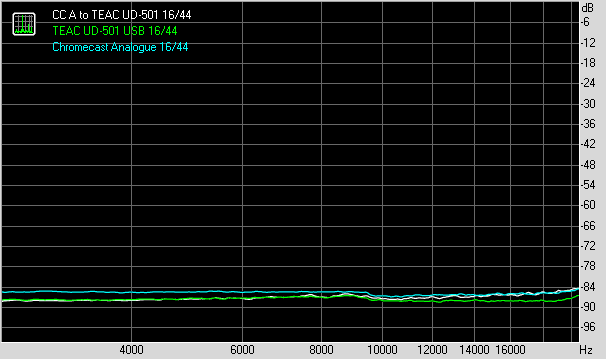 Remember, the Dunn Jitter Test was designed to demonstrate timing anomalies in S/PDIF interfaces like TosLink. Here's an excellent "Application Note" written by Julian Dunn from back in 2003 for further details. So, the question is just how jittery is the Chromecast's TosLink interface? 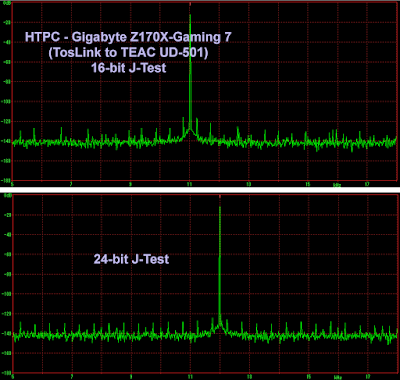 As you can see, there are some jitter sidebands in the 16-bit J-Test but it's the 24-bit J-Test that suggests this device is quite jittery compared to what I have seen in the past. In fact the strongest sidebands with the 24-bit J-Test had an amplitude about 95dB below the primary signal at 12kHz. This is one of the most "jittery" results I have seen. Nonetheless, realize that 95dB is still a very big number and this is not going to pose an issue despite claims by the most golden-eared audiophile! It's hard to know without some comparison if this high jitter is mainly the Chromecast or could it be the TEAC UD-501's optical interface itself... So, for comparison here's the motherboard TosLink coming out of my recent HTPC build (based on the Gigabyte Z170X-Gaming 7), I'm using WASAPI drivers for the built-in Soundblaster Recon3Di audio chipset's TosLink interface. As you can see, jitter sidebands are evident, and in fact some of the motherboard's 16-bit J-Test sidebands are stronger than the Chromecast's. 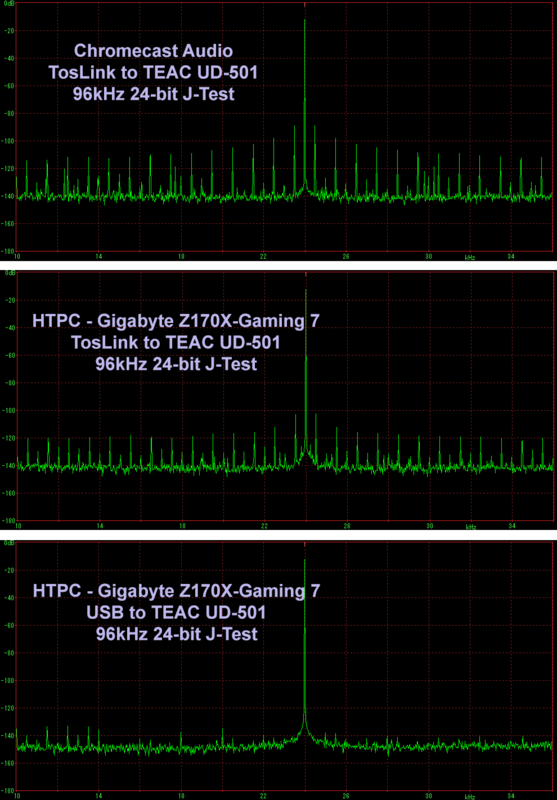 However the 24-bit J-Test is in fact substantially cleaner, adding to the evidence that the Chromecast's TosLink interface is indeed more jittery than most, including a modern computer motherboard. For completeness, here's the HTPC connected to the TEAC UD-501 through the USB 2.0 interface using ASIO demonstrating the merits of an asynchronous digital interface for audio in terms of freedom from jitter-related anomalies. Notice especially the cleanliness of the 24-bit J-Test. Well, since I had all the equipment hooked up, I thought this might be a good opportunity to try something "new" and different - a 24/96 J-Test! Instead of a 12kHz primary signal as in the 48kHz 24-bit J-Test, let's stress the signal and push it to 24kHz while doubling sampling rate from 48kHz to 96kHz. This also means that the LSB 250Hz square wave jitter modulation tone is now pushed up to 500Hz. This should represent quite a "stress test" on timing accuracy and should exacerbate the anomalies seen above with the Chromecast Audio. Remember that timing effects becomes more critical with higher frequencies and the jitter anomalies should be more evident when we do this. As you can see, indeed this "96kHz 24-bit J-Test" demonstrates the strain placed on the optical TosLink interface for both the Chromecast and the HTPC motherboard! 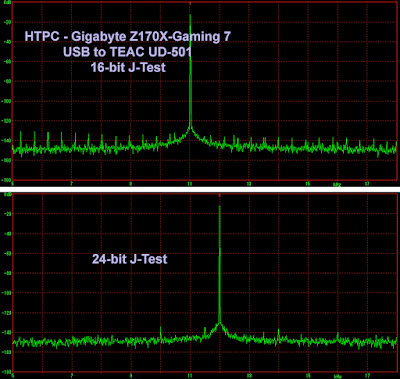 Again, we see how impressively jitter-free the asynchronous USB interface is in comparison. Although this is the first time I have shown this 24/96 test signal, I trust the result is expected and not a shock to anyone. For the longtime readers, you might recall that I had previously already demonstrated that the main problem with the TosLink interface is that of increased jitter - a good example among many over the years was when I looked at the use of a TosLink loopback with the Logitech Transporter in 2013. 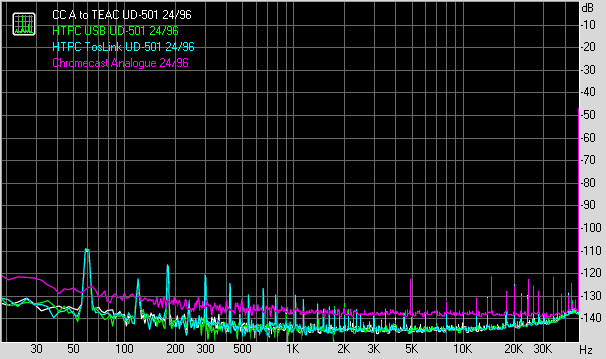 Before anyone freaks out about the result and what it means about the Chromecast, do realize that the tallest sidebands are still lower than 70dB amplitude from the primary signal at 24kHz! Considering that we're looking at a high amplitude 24kHz ultrasonic primary signal (not the kind of thing one should ever see in real recorded music, nor hear except for intermodulation products), I doubt the jitter anomaly would ever pose any issue. So how does the Chromecast Audio's TosLink digital output "sound"... Well, it sounds like the TEAC UD-501 DAC :-). Seriously, I did spend about an hour trying to hear the difference between the "jittery" TosLink input from the Chromecast compared to the computer's USB input. This was simply not possible for me switching between HTPC and the Chromecast TosLink inputs. Because USB is bidirectional and the computer senses when I switch away from it, unless I had two TEAC UD-501's side by side - one playing from the TosLink, the other from a USB connection and switching quickly between them, the time needed to start and stop USB playback is too long and I have no confidence in my ability to "remember" the sound in order to make comparisons at this subtle level. Feel free to experiment though because the Chromecast TosLink interface provides an opportunity to experience what a relatively jittery playback device "sounds" like. You can then hear for yourself whether you still believe jitter is actually a problem when high-end companies and magazines talk about the "importance" of keeping jitter low. By the way, the measured jitter amount from this little US$35 Chromecast Audio appears to be significantly better than the results from this 16-bit US$10,000 CD/DAC combo, or this very recently reviewed CD player of the same price! High-fidelity indeed :-). 1. Is capable of "bitperfect" streaming - at least for 16/44 - by successfully passing on a DTS bitstream to a digital receiver. 2. As expected, streaming digitally to an outboard DAC results in analogue output measurements consistent with expectations for the DAC. 3. 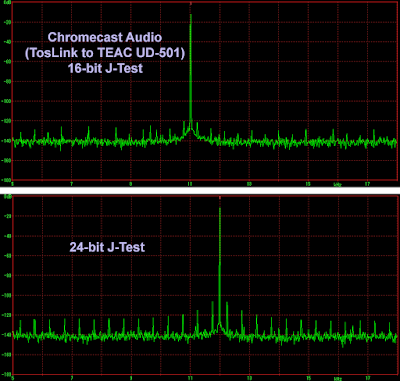 TosLink is prone to jitter and unfortunately, the Chromecast demonstrated more jitter with the 24-bit J-Test compared to most other devices I have tested. The severity of the jitter as expected worsened at the 96kHz sample rate with the novel 24/96 version of the J-Test. Remember though that the final jitter effect in the analogue output is an interplay between the sending source and the DAC. I was able to demonstrate that the Chromecast Audio was more jittery as a source than my PC with the Gigabyte motherboard's TosLink to my TEAC UD-501 DAC, but this might not be the same with every DAC. A couple of weeks ago in the post about MQA, in the comments, I mentioned that this blog is about "perfectionist" audio and objective testing to tease out subtle effects and the minutiae. To the perfectionist, we can of course pick apart performance in all kinds of ways. With that mindset, I suppose I could express a dissatisfaction with the level of jitter found. But the truth is that there's just no need to apply that level of scrutiny to a device like this given the level of quality achieved at this price point. Other than the audiophiles, nobody cares. And other than objective audiophiles where we can actually demonstrate the imperfection and reliably "grade" quality of gear based on these results, practically, it's just inaudible. I'd be absolutely happy with the Chromecast Audio's analogue output in my secondary stereo system. And I don't believe anyone is really going to notice the jitter in day-to-day use. Heck, it's only US$35.00; probably less than the amount one pays for coffee a month! Well done Google! Now if you could tighten up that TosLink timing accuracy a bit in the next version, you'd really make the final 0.1% of audio lovers (the "perfectionist") really quite happy :-). It has come to my attention that a certain website/blog claims that there is some kind of "silent majority" out there presumable referring to some kind of purely subjectivist audiophile philosophical leaning. As far as I am aware, there hasn't been any kind of census that would allow anyone to know what is or is not the viewpoint of music lovers out there. Besides, perpetuation of that kind of "us vs. them" split is rather nonsensical as I had written previously. Consider this. What is the value of presumptuously claiming that one's views resonate with the "majority" if this "majority" (ie. purely subjective leaning hobbyists on a website) is itself a "fetish minority" (ie. number of listeners who desire very expensive DACs, expensive computer servers, mystical tweaks, magic cables) of another "audiophile minority" (ie. compared to all music lovers out there)? Any way you slice it, that's a small number. Needless to say, I believe having objective results make a review more complete. In my conclusion above, I make assumptions that most music listeners and music lovers probably care little about jitter. This is a post about the Chromecast Audio after all and other than "audiophiles", how many people actually care or even know that jitter exists in a digital stream? In my opinion, objective testing allows us to appreciate the quality of engineering in the sound and in a case like this, a more complete review sheds light on this subject; something I feel that pure subjective reviews would be unable to discuss or at best simply guess that maybe a device is "more jittery". Also, here is an example of what I mean by "accuracy" and why it is not a vague notion. I hope that even the most ardent "subjectivist" can accept that an accurate DAC should be jitter-free, right? The magic number is ZERO jitter. If I were reviewing a $5,000+ DAC, should I not at least try to verify that the engineers went to the trouble of ensuring timing precision? If I were reviewing something with a $7,500 clock peripheral (on top of say a $24,000 base DAC), should I not at least check to see if that actually improved the measurements even a little to make it worthwhile (don't neglect the possibility that timing accuracy could worsen)!? So please stop with the idea that the term accuracy is somehow meaningless - yes, there are "clear targets" for an "ideal", we do know what audio engineering should be striving for. To claim otherwise without a logical, internally consistent, reasonably comprehensive, and non-circular thought process is disingenuous and denies reality. Finally to close off, I had the pleasure of attending a nice lecture this morning at the Canadian TRIUMF particle physics labs as a celebration of sorts as this is the centennial year of Einstein's theory of General Relativity (and recent LIGO discovery). It truly is wondrous to think about the mysteries of the universe. It was also a great reminder of how in science, for the sake of progress, theory and beliefs go hand-in-hand with measurements and observations. Despite his beliefs in an "elegant" universe, remember that even Einstein acknowledged his mistakes when objective measurements showed otherwise (eg. he eventually acknowledged that the universe was not a static structure but that it expanded despite his earlier assumptions). Arguments in the audiophile world is but minutiae in the large scheme of things when equipment quality including a little $35 streamer can be so good! But even here, truth I believe must be derived from that combination of subjectivity/belief/theory and objectivity/empiricism. Thanks very much for this, even if it leaves me in some doubt. My personal subjective experience is very favourable, even with high end gear. It sounds fine to me. Also, there is no doubt that it is a bargain. Finally, it is extremely user friendly. So, given the very good but not quite perfect measurements, the question remains if it has sonic limitations when used with the best amplification and speakers? From your tests I take it that moving from the analogue output to the optical digital output into a Good DAC like the Teac improves most measurements (though not necessarily audibly), but pays a price in increased jitter. How bad is that? Hello Willem. Jitter is not bad at all :-). I would prefer a better DAC than worry about the jitter. That's I guess the point of the discussion around jitter. IMO the jitter effect can be seen and measured BUT do not be deterred unless things are truly awful - it's higher than other devices, but NOT awful with the Chromecast Audio. Unlike what I have read in some "high-end audio" magazines who would want us to believe that somehow the ear is very sensitive and that even cables could affect jitter or there is need for femtoclocks and whatnot. As a "perfectionist" (you know, the 0.1%! ), I want to point out the "issue" so that hopefully the next version can improve on it as an engineering exercise. But the human ear I believe would not be able to discern the difference. *Practically* this is already good enough as your own listening has informed you. It seems that the Chromecast only does "push" streaming, i.e., you have to send the audio from a compatible app. Anyone interested in an inexpensive "pull" streamer should look at the Gramofon. https://gramofon.com . I have one of these and it works well. I have tried it in my main system and the sound is fine, although I use it mainly to stream music and podcasts to a Tivoli PAL in the kitchen. You control it using the Qualcomm Allplay Jukebox app on a smartphone or tablet and you can choose to stream content from the phone/tablet, from internet sources like Spotify, or from DLNA servers on your network. One Allplay feature is that you can play either the same (synced) or different sources on multiple Gramofons. The Gramofon has ethernet, but I've only used it over wi-fi. 2 downsides are that the output is analogue-only, with no digital option, and that it uses its own mains adapter instead of the now increasingly common 5V USB charger/supply. It's also a bit bigger than (I think) it needs to be but still sits nicely on top of the PAL. It's been reviewed in the hi-fi press and at tech sites and came out well. In the eyes of the audiophile anything is better than the noisy 5V you are getting from a computer's USB port. So the separate power supply is a pro not a con if you approach it from their point of view (and also it can be replaced by a true linear high quality power supply easily). The analog only output is more of a concern as now you are limited to the unit's built in DAC. I think this is not quite true. With the Chromecast you use your smartphone (or tablet) to instruct the Chromecast what to do, but after that you can turn the phone off, because the Chromecast makes a direct connection to your router, and pulls the audio from there. Right. Once the Chromecast finds the connection with the server it pulls the information out itself whether off the cloud or local server it's being connected to. You can also "push" content from a phone or tablet to it as I mentioned in Part I to play "side loaded" content but I believe that goes through a lossy compression step for audio probably similar to when you mirror the video image on the HDMI Chromecast. Thanks Willem. That wasn't clear from the reviews I've seen, including this one. Archimago, I think you can only buy the Gramofon from the website but they ship worldwide. In practice, I wonder how many users of either the Chromecast or the Gramofon would bother with a separate DAC? I am not bothering with a separate DAC for the moment. The CC plays into an old refurbished Quad 33 pre amplifier with level adjustable tape inputs (a neat feature typical of Peter Walker's practical genius). Next in the chain is a refurbished Quad 606-2 power amplifier. Speakers are Quad 2805 electrostats and a B&W PV1d sub equalized by an Antimode 8033. I am keeping the Quad 33 pre amplifier for the time being, since we still like to use the FM3 tuner (easy to switch on for the news etc) and we have not yet sold the Linn LP 12 vinyl deck. Once we have decided that we no longer need any analogue sources, I am planning to change to a modern pre amplifier with just digital inputs. I do think both from my listening and from your measurements that the CC DAC is good enough that I do not need to get a stopgap DAC until I buy a new pre amplifier. Isn't it amazing that a $35 unit can sound better and be far more convenient than a vinyl deck that costs thousands? Technology has really moved on, even if not for the lovers of vinyl and valves listened to in candlelight. But GASP! A $35.00 music streamer instead of an iconic Linn LP12?! Thems fightin' words, the kind of thing to trigger audiophile holy wars :-). Congrats. I bought the Quad 33-303 combo in 1971 when I went to university, and ELS57 electrostats when I started graduate work. I am still using the same Q33, and the refurbished 303 is used to great effect by my son (with a Beresford TC 7510 dac with volume control and old Rogers LS3/5a speakers). So I started in the days when audio engineering was still science driven rather than dominated by quacks. I have always kept my gear for many years, as progress has been slow. So in the end, total cost of ownership has been quite low. Adding a first generation Philips CD Player represented big progress. The recent upgrades were primarily because the old Quad ELS57's were approaching the end of their life, and because we now have a far larger living room. Digital sources and that large room for the first time allowed reproduction of deep bass, hence the addition of a sub (but not without dsp room eq) and a much bigger (second hand) amplifier. My preference for rationally designed value for money top quality gear has not changed in all those years. For me, using the Chromecast is a logical step along that path. Mass produced electronics have matured inot perfection ages ago, and the only changes are that they are getting cheaper and cheaper thanks to improved production technology, and that we have a succession of new media in which the music reaches us. All that remains to be improved are speakers and room interaction. p.s. the system in my study is a similar mix of expensive and cheap: my existing desktop computer as a source, playing into an ODAC usb DAC, fed into an Emotiva Control Freak volume control (or passive pre amp as some would call it) and then directly into an old refurbished Quad 405-5 power amplifier driving the Harbeth P3ESrs that replaced the old Rogers LS3/5as. Again, the money went where it matters: the speakers. "Again, the money went where it matters: the speakers." That right there is the key. Good job! Hey Archimago, I like to see these tests even if I may not be able to hear the high frequency jitter at -70dB. If I can choose between a high or a low jitter connection, I would of course go the lower one, at least into my high resolution system. In my listening lowering the jitter seems to make the background more silent. I haven't measured it, it's just subjective, so I can't even be sure the jitter is lower. It may be all psychological, as in knowing it's low jitter allows me to not worry about it. In less resolving systems, where it's more casual listening, say in the car, or in the gym, then the source matters less. When I read tests I want as much objective data as possible. Reading TAS, which I have enjoyed over the years, is less meaningful because they only do subjective. In addition whatever minute changes can be heard, it seems they are quite frequently exaggerated. In that regard, Stereophile, HiFiNews mixing subjective and objective are preferrable. With age, and being male, it's a scientific fact that hearing will lose accuracy. For this reason I expect my listening requirements already have relaxed. Some five years ago, amazingly, I could still hear 18kHz, and this is no longer possible. Furthermore if the DAC is asynch, uses some type of input buffer and reclocks, it will be able to capture the signal, and then the digital domain jitter on the DAC input should be irrelevant. That's they way I've understood it. It will be decoupled and hence irrelevant. For source jitter to have an effect on such a DAC I've gathered it will have to be very, very high, so that the buffer isn't able to keep up. On a side note, I wonder why TosLink is used, if it is indeed introducing jitter. I guess for cost and packaging reasons - only one output port. I tend to skip it if I can, looking for S/PDIF. In my mind jitter may be relevant if problems of higher magnitude have been properly adressed, most notably the room interaction, or speaker distortion. These are order of magnitude greater than jitter. I'm still interested in reading about jitter though, and seeing tests. BTW it would be interesting to see the Chromecast audio quality and jitter compared to various iterations of Raspberry Pi add on audio cards, such as the HifiBerry, IQaudIO or Cirrus Logic/Wolfson. With the PiZero ($5+cabling+psu) and a cheap DAC it could rival the Chromecast, at a price premium, and it would be interesting to see if it supersedes it in terms of audio quality and measurements. IQaudIO even have a 2x35 digital amplifier card. Thanks for the note Gadgety. Yeah, TAS can be entertaining at times - nice pictures, high quality paper, etc... But beyond that they've really published some crazy stuff over the years and seriously worsened the credibility of audiophiles with these articles IMO. Lack of objective analysis and unbelievable claims of hearing acuity (what's the average age of the reviewers they hire?) add to the problem. TosLink I believe was the first form of S/PDIF released as far as I can recall on some of the early Sony players. I still have an old Sony Laser Disk player that only had TosLink, no coaxial from the 1980's. Someone correct me if I'm wrong on this. There are of course benefits to optical - longer length potentially, galvanic isolation definitely. Although jitter is typically more than coaxial, it's not a given as I have seen idiosyncracies where coaxial is worse than TosLink (for example my Onkyo TX-NR1009 where coaxial was the most jittery even compared to HDMI). Yeah, I guess one day when I decide to build my own Pi system, I'll definitely give it a measure! Alas, other than curiosity, I'm not in need of yet another streaming device at the moment :-). TOSLINK is all about 'cheap'. The reason they 'jitter' is because of the way most of the receivers are constructed and the dynamic range (about 10dB) they must have. These cheap, and easy to assemble without specialised tools, optic connections are intended for relatively low bitrate (6 - 15Mb/s) Asynchronic datastreams over relatively short lengths (10m up to 1000m for specific receivers/fibers). There are versions that are intended for NRZ synchrone transmissions only and they can even reach 250Mb/s. These are not made for SPDIF signals. The TOSLINK digital audio signal is a 1:1 'optical copy' of the electrical SPDIF signal. Making a driver + transmitter is thus simple and cheap. The receiver is also very simple and will give out TTL level signals which can be fed into any SPDIF receiver chip directly. There is NO signal re-conditioning done anywhere in any of those chips. Only a very 'crude' detection is done inside where the 'detection level' is set to about 'half' of the optical peak input level. Due to a limited bandwidth of the receiver various types of jitter are present in the detected signal. You could 'clean' up the optical transmission to perfection but the following optical receiver will 'f' it up again. Re-clocking the received optical signal will most likely reduce the amount of jitter substantially but don't think most manufacturers will bother as TOSLINK is limited in bandwidth anyway and not considered as a 'serious' datastreaming format. The only reason (to me) for using TOSLINK would be if no other input were available or galvanic separation is called for. There are other ways of achieving galvanic separation though. Ooops, yes, should have been coax S/PDIF, but the coax word got lost between my brain and my fingers. Must have been jitter. OK, good to know I shouldn't be expecting any RPi reviews from your eminent blog. The appeal of RPi, the way I understand it, is it can work as a an always on server, not only a receiver, it does more than audio, so can work as media center, and it even does 3D MVC hardware decoding, afaik. So as a secondary system, or a bedroom set up, or an always on server with minimum energy usage, it has advantages over the Chromecast. Hi Solderdude, I am using TOSLINK in my system for the purpose of galvanic separation between sources devices (i.e. CD transport, PC as music server, etc.) to my DAC. Do appreciated if you could share with me on how we could do complete galvanic separation without using optical connection? I really want it. Thanks in advance! When using SPDIF (RCA/coax) you can isolate using a (specialised) pulse transformer. The CD transport may only have RCA SPDIF and TOSLINK. When the DAC has USB input the 'intona' (http://intona.eu/en/products) could be an option for the PC/server. You have to make sure the impedance matching is accurate (75 Ohms) and may have to modify input and/or output circuits. Normally these transformers are designed to be incorporated in the design (source and or receiver side) which in some cases they already are. Just check inside to see if there are small transformers/coils in close proximity to the SPDIF or AES/EBU connectors. pulse transformers with a 1:1 ratio designed for 75 Ohm (SPDIF) and have a bandwidth from 3MHz to 50MHz will do. Yes, bits are bits and won't topple unless data is mutulated so much that a 1 is misinterpreted as 0 or vice versa. This could be caused by unsuited (non 75 Ohm) cable, wrong load impedance, restricted bandwidth (because of too high capacitances ?) for instance. When this happens you'll hear it (ticks, degradation, noise, etc). Jitter, however, is the timing aspect which does not affect the actual bitpattern but could potentially mess with the synchronisation of the receiver clock. In older DAC circuits this may lead to higher jitter effects in the analog domain. Newer DAC receiver chips usually have decent de-jitter circuits and simply reclock internally so are thus not affected any more by jitter in the source signal. But as said it depends on which SPDIF receiver is used, the transmissionline and how it all is configured. To get it right a suited oscilloscope (with very low input capacitance, think active FET probes) may be needed to get it really right as a retrofit. Does the pules transformer required to be used in a pair, one in output side and one in input side? 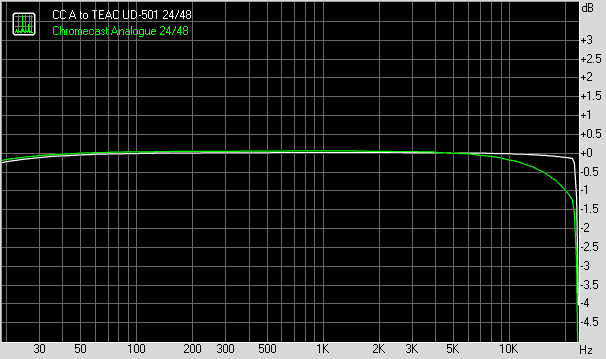 My ifi iLink (USB to RCA/Toslink converter) does support transformer coupled output but my Benchmark DAC2 HGC does not. One transformer in the 'chain' is already enough. Provided the screen of the RCA/BNC is not connected to the ground of the PC (when it is mounted in the source) or the ground of the DAC input. A multimeter can easily show if the input is truly isolated. Thanks Solderdude! Really appreciated for that much of information and they are very informative. However the RCA/BNC modification is a bit out of my capability. I've just ordered the Intona and do like to compare it to Toslink soon. quality of the audio conversion. Specified performance is consistent and repeatable in any installation with cables of any quality level!". In my understanding, it should produce exactly the same sound quality if jitter induced by Toslink (or Coax) does not go off limit which I would expect it valid if signal lock LED do not flash or turning off. However, it doesn't seems to be the case in my testing earlier today. I am using a notebook connected to a iFi iLink (USB to Toslink converter) then Toslink connected to Benchmark DAC2. The notebook is battery powered and iLink is powered from notebook USB port. The use of Toslink will provide complete galvanic separation to avoid any kind of electrical noise from notebook or iLink. The Toslink is a 0.5m POC cable come with iLink and I would prefer more on its SQ over another 1.5m QED Ref glass optical that I have. The interesting finding is the bending angle/curve of the Toslink will result in different SQ. Moving the iLink further away from DAC which making the Toslink cable straight, will produce less musical sound. Push the iLink closer to the DAC which bend the Toslink to certain curve will produce the best sound, that sounds a lot more musical, more natural and sound like live. Any distance in between will result in different SQ. The signal lock LED never has abnormal flashing or turning off during all the test (It's normal to turn off when switching between tracks). In my past testing using RME and Lynx to capture the bitstream for validation, the POC Toslink cable is fully capable for bitperfect transmission. All I would suspect is that there may be jitter level variation when bending angle/curve is different. Just hope someone could tell me why this happened. Most of the jitter reduction circuits have limits. Beyond those limits almost certainly there will be some influence seeping through because there is always an active circuit that needs to compensate things and may not be able to do this instantly. The thing with bending fiberoptics is that the light intensity varies. When you bend fiber optics beyond a certain diameter the amount of light becomes less. This is hard to see with the naked eye because our vision (just like hearing) is closer to logarithmic behaviour. As F.O. detectors are 'linear', small level differences are easier to measure and can affect signal integrity. TOSLINK receivers adapt their '1-0 decision' point based on the average (actually peak/2) light levels it receives. bending the fiber 'modulates' the decision level as the peak level detection isn't instant, it takes some time to set itself. Also these receivers have a very limited bandwidth. This means the rising and falling edges are 'sloping'. When bending the fiber you alter the pulsewidth temporarily and then it goes back to 'normal'. This can give an extreme amount of jitter. MUCH higher than any electrical transmission can give. Severity depends on: the amount of light from the source, fiber used (attenuation), the actual TOSLINK receiver chip used (brand/type), sample rate. As long as there aren't any bits toppling over sync will not be lost and the light won't blink. That doesn't mean there can't be huge amounts of jitter that 'affect' the anti-jitter circuit. When 'overloading' a TOSLINK receiver with optical power chances are jitter will also become higher (depends on the receiver and sample rate). TOSLINK is a very low quality 'connection' that is intended to be used stationary and is not really suited for high samplerates either. Personally I would use USB or coax SPDIF or AES/EBU over TOSLINK unless it is the only way to connect or for some reason galvanic separation is essential. One would have to measure (and/or) conduct blind tests (which don't have to be double blind at all) to determine the actual amount of jitter and the audibility. "So please stop with the idea that the term accuracy is somehow meaningless - yes, there are "clear targets" for an "ideal", we do know what audio engineering should be striving for." Fine, until TAS or Stereophile or whatever asserts that hey, this form of inaccuracy sounds *better* and therefore must reflect some unknown auditory/acoustic characteristic that live acoustic music has. This is how they argue for the superiority of vinyl. 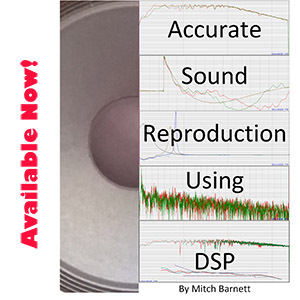 'Euphonic' distortion is more accurate than measured accuracy! I agree with you except for that I love the sound of good vinyl. I can only assume that vinyl sounds better to my ears not because of the euphonic distortion but because of the lack of only two samples to represent a 20khz signal. I know that the reconstruction filter can smoothly reproduce a 20khz sine wave, but I have serious doubts that it can reproduce an audio signal above 10khz with the same fine detail, meaning truthfulness, or fidelity as analog can do. Just as the author of this blog points out many times that jitter is not audible below a certain amount, distortion is also not audible below a certain amount and so the distortion in a vinyl record is not really audible, but presents higher frequencies with higher fidelity than CD. Higher sample rates to my ears are more truthful and get closer to the sound of analog. I think this praise of vinyl is technically incorrect. It cannot both have more distortion and at the same time be more truthful. If one looks at the plots of vinyl systems they almost invariably have a rather big high frequency drop. They sound warmer because there is less high frequency signal. As for the often quoted increased detail of vinyl, this may be due to the significant compression of a vinyl signal. This raises the low level signals closer to the level of the dynamic peaks. So yes, you can hear these details more clearly, but at the expense of dynamic reality. I have tried Chromecast out but ultimately gave up because it noes not support gapless streaming. Does anyone know how this might be achieved? So would one be able to hear a difference between the analog and digital output with CCA? Did you hear it? I am trying to decide if it´s worth buyin a amplifier with an extra digital input (marantz pm6006 vs pm6005). I am using the analogue output of a CCA in my main system: QUAD 33/606-2, Quad 2805, B&W PV1d with Antimode 8033. The sound is excellent, but there is one issue. Any analogue source output has to be matched properly to the input sensitivity of the pre amplifier stage. Many pre amps have an input sensitivity that is too high. This sounds impressive in the showroom, but introduces clipping in loud passages. With the Quad 33 I could avoid this using the redundant adjustable tape input, but that is a pretty unique feature. For my next pre amplifier I wil certainly opt for one with (many) digital inputs, to avoid clipping risk, and to serve as a direct connection to the digital output of the television and the BD player as well. For my modern but more basic bedroom system I use a digital input. Sounds good too, just as into my son's largely legacy system (CAA into the digital input of a Beresford TC7510 DAC/preamp, into a Quad 303 into Rogers LS3/5a. But i do think marantz 6005 is an integrated amplifier, so i dont really know where that puts me. Now I understand the question: do I need 2 optical and one coax digital input, or is one optical and one coaxial enough? It all depends on what you want to connect. The pm6005 is quite a bit cheaper, at least here in Holland. I wanna connect my TV (have to be optical) and then chromecast audio. So i was thinking if the analog chromecast is good enough i could just buy the Marantz 6005 and save me some money. As I said, I am happy with the analogue output of the CCA, even if I will use the digital output once I get round to buying a new pre amplifier. You have two other options. The first is to use the TV's analogue output (i.e. its inbuilt DAC). Chances are this will not be as good as the DAC in the CCA, but TV audio is rarely very good anyway (unless you direct your superior hdmi Bluray audio output through the TV). The other is to use a (cheap) optical to coax converter. Wondering if you would consider re-running the tests on the Chromecast as reported on Headfi the recent firmware updates have improved the Jitter quality of the CCA.... Reason I am asking is my current Listening setup is a CCA Toslinked to an Audio-GD Dac (9018 based mid ranged unit), with Hifiman Edition X V.1 cans. I asked what the weakest audio link in the chain was and have been told its the CCA. Not what I would expect, and from what I understand about Higher End Audio not likely. Thoughts? You said, "The first thing that needs to be addressed is whether the Chromecast Audio is capable of "bitperfect" output. Now, I do not have an easy way to capture the digital output, but one thing I can do is to make sure that a DTS signal encoded as 16/44 FLAC can be streamed from Plex to my digital receiver without audible issues... Indeed, in this regard the Chromecast succeeded." I can only convert the DTS signal to SPIDF, then PCM 2-CH WAV. The Chromecast supports PCM and my receiver reports DTS 5.1. Can you explain how you converted DTS to FLAC without the decoding of DTS? What tools/commands etc? Are you able to package a DTS-HD signal into FLAC? Thanks for your work. First google search led me to this subjective jittery audiophile post that only confused me about quality of digital output, and you clarified this perfectly. I am happily using the Chromecast DAC in a high end setup. However, ideally I would avoid using an analogue amplifier input as there is always the risk of a sensitivity mismatch (many amps are too sensitive for modern 2V devices, which leads to a harsh clipping sound). Beyond that, and the need for as much output power as you can get, there are no meaningful sonic differences between amplifiers. Much depends on the number and kind of inputs that you want to use. If the Chromecast is your only input, you could even omit the pre-amplifier part of the story and just use a passive volume control with a power amplifier. But if you also want to connect the digital outputs of a television and a disc player, you are better off with an amplifier with a range of digital inputs. Since you seem to be in the UK, how about this receiver: http://www.richersounds.com/product/amplifiers-receivers/cambridge-audio/topaz-sr20/camb-sr20-blk Three digital inputs, plus 2x100 watt amplification. As for digital cables, the story is mostly simple: either they work, or they don't (bits are bits). There are no sonic differences. 1) You are using your Chromecast in a high end set up. What is your set up if you don't mind me asking? 2) I need to avoid using the analogue out put of the chromecast or any dac like the dragonfly red that has a high 2v output? Or would the dragonfly red or even black work well from a laptop the can decode MQA files through the tidal pc desktop app? So my main aim is this. I like the sound of the Q acoustic 3050 speakers and want a good amp to match it that is within my £3-400 budget. i want to be able to play streamed music well from tidal and spotify. I have not bought much music so dont have a large library of music. The Rasbery pi & dac sounds like a good. I am computing teaching and this would be a cool project for my students. I described my two serious systems in one of th earlier posts in this thread. Suffice it to say the one in the lounge that I use with the analogue output of the Chromecast has Quad 2805 main speakers (plus B&W PV1d sub with Antimode 8033), and a Quad 33/606-2 amplifier. There are few systems more revealing than this, I think. As for amplifiers, they have been a completely mature technology for decades. So once a few basic requirements are met, all properly designed solid state amplifiers are sonically indistuinguishable from each other. But those conditions do matter. The first condition is that the amplifier is powerful enough to reproduce the dynamic peaks in music. You would be surprised how much power is needed for that. As long as your room is not too big, something like 100 watt rms per channel is about right with medium sensitivity (86 dB) speakers. Important is a beefy (and expensive) power supply. Fortunately there are many models from main stream manufacturers to choose from. The second is that the frequency response should be largely load independent. Amplifier impedance varies over the frequency range, and the amplifier should be able to nevertheless reproduce a flat response. Valve amps find this hard, but most properly designed solid state amps are more or less OK. A beefy power supply is once again important. Finally, input sensitivity. Many sources adhere to the cd player standard of 2V. So that is what the amplifier should match. However, manufacturers (some more than others) have increased input sensitivities to make their products sound louder in the demo room (and louder sounds better) to gain a competitive advantage. The bad news is that this leads to clipping distortion on the inputs and hence a shrill (and 'lively') sound. The easiest solution is to use a well designed amplifier with digital inputs. But once you have attended to these three conditions, they all sound the same if played at *exactly* the same level(and I mean within 0.2 dB - you need a volt meter for that). So go for one with a beefy power transformer (i.e. a heavy unit), and a low price per watt. If you only use a Chromecast, a television and a (uhd)bluray disc player (with digital stereo audio output) as your sources, you only need three digital inputs (usually two coaxial ones and one optical, but there are adapters to convert optical to coaxial or the reverse). A usb input is only necessary if you use a computer as your source. My hunch is that the DAC built into e.g. a receiver like the Cambridge Audio that I mentioned measures at least as well as or even better than the small external dacs such as the Dragonfly. But I would not expect to hear any sonic differences. I am sceptical of the sonic benefits of MQA. The big Denon amp that you refer to is an AV amp. It has many channels that you do not need for stereo, and it is full of noisy electronics in such a small case. I am sure it is a remarkable achievement, but it is a compromise optimised for different demands (Archimago has tested such units in the past). So, honestly, in the UK market, I would be surprised if for 400 pounds you could do better than the Cambridge Audio receiver that I linked to. There are a few amplifiers from e.g. Yamaha in the same power range, but these tend to have only two digital inputs, and I do think that is one too few. Willem, how did you encode DTS to FLAC without it decoding DTS? Did you just convert to PCM 2 channel, then convert to FLAC? Regarding DTS --> 5.1 FLAC. Just use foobar! Install the DTS decoder plugin, then get the .dts or .wav files into the playlist. Make sure they decode properly on playback (ie. does it play the music?). Then right click on the track(s) and "Convert" to the proper format like FLAC. The Yamaha AS701 is another fine amplifier, and I expect it to sound exactly the same as the Cambridge Audio. The only difference is that it only has two digital inputs, and for me that is one short (tv, disc player, Chromecast). For more information on the need for power, and for the fact that sonic differences between decent amplifiers are hard or impossible to hear once you compare them rigourously, see various threads on the Harbeth User Group. I paid 350 euro for my refurbished 2x140 watt Quad 606-2. The modern Quad QSP is essentialy the same amplifier and I think it sells new for some 1200 pounds. Chris, I never converted DTS to Flac. Why do you think I did? I just stream Spotify using my Chromecast in the lounge and using my desktop computer and an ODAC dac in my study. The first thing that needs to be addressed is whether the Chromecast Audio is capable of "bitperfect" output. Now, I do not have an easy way to capture the digital output, but one thing I can do is to make sure that a DTS signal encoded as 16/44 FLAC can be streamed from Plex to my digital receiver without audible issues... Indeed, in this regard the Chromecast succeeded." That wasn't me that was Archimago who posted this. Sorry, had you confused with the author. Maybe he'll chime in. With regards to jitter in the TosLink, do you have any experience with anti-jitter devices such as the iFi SPDIF iPurifier (https://www.amazon.com/SPDIF-iPurifier-Digital-Optical-Filter/dp/B01KKFTM5S), and whether they are effective? It is amusing that at $149, the iPurifier is "affordable" by audiophile standards but it is 4x the price of the CCA, a testament to the incredible value of the CCA. No, can't say I've ever spent time with these devices. Years ago a friend had something like that but I never got to measure the thing. I think it is strange that a device like this has no measurements to be found, not even in the manual itself. Something as simple as a before and after J-Test from say the CCK or AppleTV SPDIF output would make a world of difference in improving credibility IMO. That image of the red "Before" signal compared to the cyan "After" is obviously simply a cartoon! Wow. 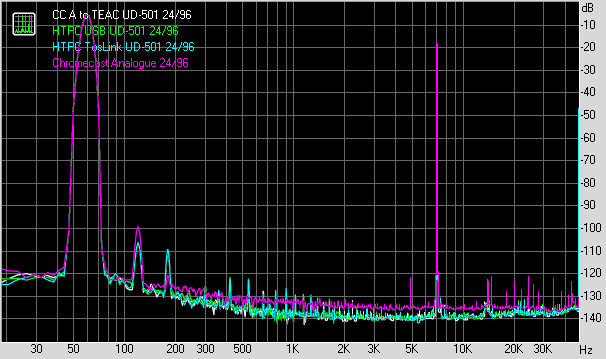 Those are some nasty jittery S/PDIF J-Tests being posted! Seriously, the AKM and CS-based receiver chipset DACs are worth $400-500 these days!? And perform with -70dB peaks in the 16-bit J-Test?!!! IMO, I have not seen such performance. Even a Squeezebox Touch to TEAC UD-501 with TosLink out (which I'm going to use as an illustration in the post this coming weekend) have sideband peaks below -100dB if we normalized the J-Test primary signal to 0dB. 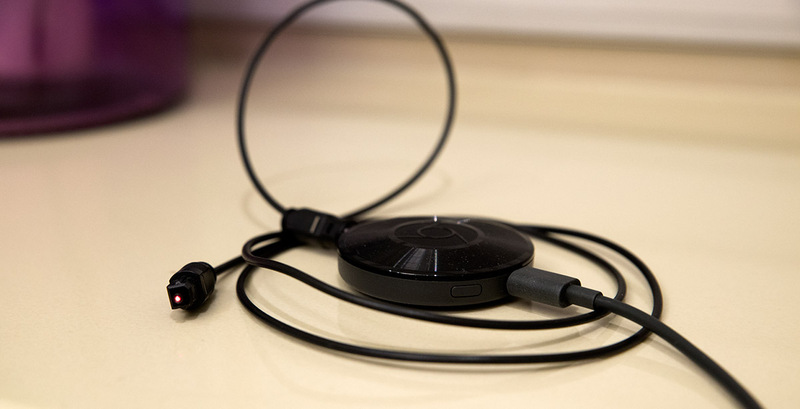 The Chromecast Audio performs even better than that in this post. Otherwise as far as I'm concerned it's just more FUD from iFi. Remember last year I took down my "USB Audio Gremlins" post due to complaints (presumably from them) as I quoted from their promotional material posted on AudioStream and disagreed with what I believe is nonsense. Ultimately sure, maybe their device performs as advertised. That's good. I'm just not worried about jitter and disagree that it's typically *that bad*. I have the CCA directly linked to an old school adcom power amp. I use Tidal to stream music from my laptop. Its DAC is extremely good with full 24bit/192khz support. With no wires, remote and no apparent reduction is sound quality I feel quite liberated. I agree with your appreciation of the Chromecast Audio, but I have two observations. The first is that its unless something magical happened in the meantime, its maximum resolution is 24/96 and not 192 (not that that makes any audible difference). The second is that if you are streaming from a Chrome tab on your laptop, you are apparently not getting the best possible results as it continues to stream from the laptop rather than directly from the Chromecast (once the connection has been established). Why not use your phone or tablet to cast? Did anyone tried to extract I2S signal from the CCA? When i play music from my Phone or PC (PLEX app) and Cast to Chromecast 2 i have no sound, on the projector i see the cover and status of the melody but no audio, Chromecast 2 is used with a HDMI Audio Extractor and audio is output thru optical cable. If i Cast a video or melody from Youtube everything is working fine (audio and video). I tried to get the sound from HDMI Audio Extractor in analog (RCA) and audio is working fine (video mode and audio - PLEX). I use a Panasonic SAHE 90 for my amplifier. Many thanks for this interesting read! Quick question, I have a Chromecast Audio and an Arcam rPlay hooked up to a Lyngdorf tdai-2170 (which is a DAC). I can play the same song, switch back and forth but struggle to hear a difference between the two, so thinking about returning the Arcam (which was quite a bit more). One thing that makes me doubt is that I can change the volume of the chromecast output, where the volume on the Arcam the volume is fixed and can only be changed by the dial on the Lyngdorf. I don't have the Chromecast Audio any more (family wanted to use it months ago) but the volume control is done with digital attenuation and of course would make the output from the SPDIF non-bitperfect (this is why to bitstream a DTS signal, the volume has to be 100%). No "resampling" needed to accomplish this since the samplerate remains the same. Thanks for the test. I happily use a CCA with a old Audio Alchemy 3.0+DTI Pro 32 and yes it sounds good. Dti pro 32 can reclock it which means the digital signal can't be really bad. I have a SB classic either. Archimago, what is your subjective impression when comparing CCA analog versus the CCA-TosLink-Teac? I understand you don't have the CCA anymore, but perhaps you remember. Is the difference night and day or subtle? It sounds a lot better when powered through a battery pack. Can you measure with different psu or batteries? I'll have to read more in this blog... Excellent article. Forgive me reviving an "old" thread. When using the CA as an optical streamer into an external DAC, how is volume control achieved? Currently I run the analog audio out of the Chromecast into a pre-amp. I set the volume on the pre-amp to what will be my maximum level and then using the Google Cast app (or Plex) on my PC, adjust as needed. When the CA is used in a purely digital mode, I'm wondering if and where volume control is done. Just what I was looking for. Thank you for putting this out there, it is so useful. There is no difference between the analogue out and the digital output with regard to volume control. Ron´s set up is exactly what I do with our bedroom system: digital output into a small Ava Maestro 50 digital amplifier with digital input, hidden away in a wardrobe (the amp has auto on/off). I set the maximum level on the amplifier, and we control the exact volume (i.e. further reduce it) with the app on our smartphones. The upgrade to the Pioneer also allows me to avoid the internal DAC of my Panasonic plasma screen and the internal DAC of my older entry level Panasonic Bluray player. The improvements seem biggest with the TV, and least with the Bluray player, with the CCA in between. But differences are small, and could be an illusion.